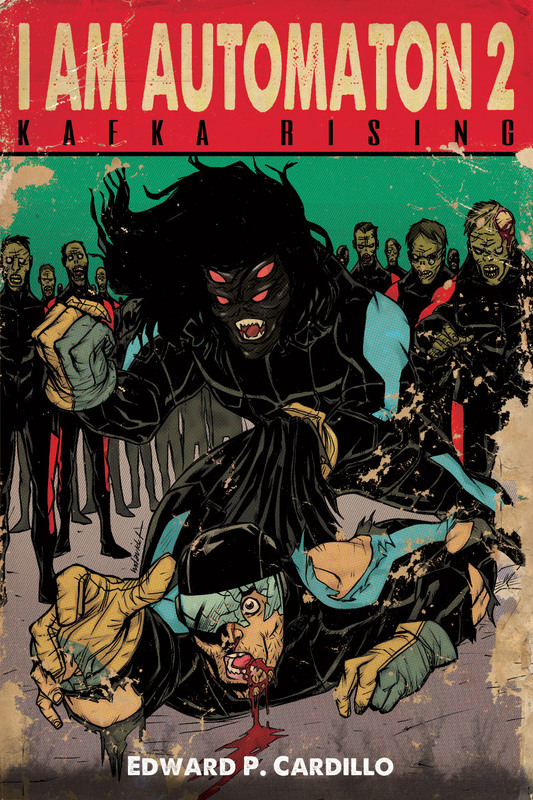 The Orphans; Origins Vol 1 By Mike Evans. It isn’t often you get to see the Origins of what makes a hero. In the first book of Mike Evan’s The Orphans Series we’re introduced to some characters that have a long way to go, to become the hero’s the world needs. Shaun is a teenage boy, just starting in high school, with his best friend and girl he loves Ellie. He doesn’t get along well with his father but hopes that soon he and Ellie will be happy together and he can maybe forget his feelings of abandonment he feels towards his father. 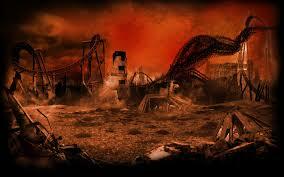 Then everything changes, and Shaun feels like his world is coming to an end, but this is just the beginning. I have to say, this book is fast passed and a blast to read. The character’s are likable and well developed, the backstory is well told and gives you a feel for why the characters are the way they are. They’re not thrown at you in a this is how it is, like it or lump it way. Shaun dosn’t just hate his dad because that’s the cool thing for teenagers to do, he has a legit, solid and very painful reason for hating his father. I loved how fast paced this book was, and that it didn’t get overly wordy on the scientific points, describing how and why the virus came to be. I felt joy and tears for this small cast of characters. The story is well rounded and dosn’t just drop you into the apocalypse and leave you asking questions, The Orphans is a story that runs into a slow build at a high rate of speed. There is a bit of time jumping back to the past, but its all very important and gives you an idea of why what eventually happens does just that. And if you pay close attention you will see how The virus goes world wide. All in all this was a great, fast paced book and I definitly can not wait to read book 2 and 3 and whatever else comes up next in this series. 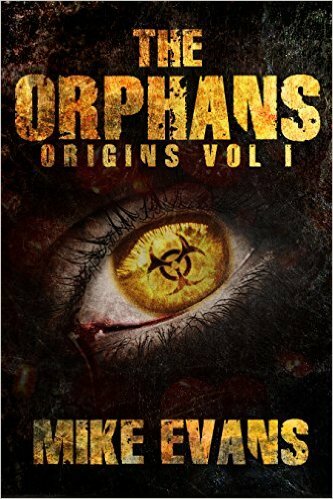 The Orphans; Origins Vol 1 by Mike Evans can be found here On Amazon. Mike Evans lives in Iowa with his wife and children. 2 hours Reviewing the apocalypse Promo-thon Master list! Check these books, Series and Authors out! They are awesome! Author Promo: Shannon Delany The Awesome Author of 13 to life, and Weather witch Check her out! Series Promo: The Artisans of Albia by Cas Peace, a Nail biter of a series that leaves you wanting more every step of the way. Author Promo: Cameron Jace: Love Fairy tales? Love Fantasy? Love new takes on old Stories then this author is for you! Series Promo: Six feet from Hell by Joseph A Coley, It all starts Six feet from Hell. Where it end? Read to find out!! Series Promo: Zombie Fighter Jango: The Road to Hell is Paved in Zombies. Find out how, by reading it today! Author Promo: Michael Bray, the author of the best selling Meat, and Whispers this man is a master at spinning tails of suspense and terror. Series promo: Escaping the Dead: Whiskey Tango Foxtrot Vol 1. By W J Lundy. The radio goes quiet while on convoy in Afghanistan, a lost patrol alone in the desert. Series Promo: Gameland: Season one by Saul Tanpepper. Zombies are just a game…arn’t they? Find out by reading this page turner of a series. New authors promo: Horror in Bloom;Spring into some great Horror by some great new Up and coming authors. Short Story Promo: Eat me or Bite me (just don’t ignore me) What do you do if your the last woman on earth, and the last man on earth is right across the Alley way? Read this awesome short story by Alan Dale to find out. Author Promo: J. Rudolph, the amazing Author of the Reanimates Trilogy. Check her out! Book Promo: Mystery intrigue, Zombies? The Moon landing was faked, wanna know how, sink your teeth into One Undead Step: A Zombie Novel, By Ian McClellan. Book Promo: Looking for exciting? Fast paced Adventure in a world that will suspend disbelife for awhile? Then you definitly need to run out and get your hands on Sad Wings of Destiny By Thom Brannan. Series Promo: The Apocalypse is coming! Are you prepaired to survive? Maybe getting your hands on The Mace of the Apocalypse Series by Dan Williams will help you get ready. Author Promo: Enjoy Cruises on ships destined to survive the apocalypse Zombie or otherwise? Then you need to check out all of David P Forsyth work today! I am Automaton 2: Kafka Rising By Edward P Cardillo. I’ve said it before and I’ll say it again, Edward Cardillo is amazing when it comes to combining both military fiction, and Zombies together. This book the second in a series picks up right where Book one I am Automaton. And it goes nonstop til the ending. Every turn of the page was another twist that left me going. I need more, and when I reached the end I was almost ready to throw my kindle across the room. I wanted more, and Edward has already delivered with a third book. Which I can not wait to start reading. But, this book delivers a one, two knock out punch in rapid succession that will leave you laying on the floor gasping for air. Peter and Carl Birdsall have survived the events in the first book, but neither of them survived it unchanged. Peter lives with a horrid weight on his shoulders over the death of his men in Tora Bora. While Carl is changed on a level, that no matter what happens with him, he will never be the same again. After an inspection he is cleared again for duty and from there on, things go from bad to worse. With a new found ability that is making him a bit of a star, and soon to be a martyr. Things quickly go south for the brothers, and soon Carl is on the run with new friends and the US Army and his own brother as an enemy. But, things aren’t always as they seem. Like I said, its a one, two punch knock out, I picked up this book on a Monday and was done with it by Tuesday night late. It was an edge of your seat, hold on til your knuckles are white, roller coaster ride. Where at the first book was a slow build, its sequel slams you into the shark infested waters face first and holds you under til the last gasping breath. And when you surface at the end, it makes you wonder, what comes next. I know I had trouble putting this book down and getting sleep when I needed too, and drove everyone around me nuts when they were trying to talk to me. Either way if you think the world we live in now is scary, wait until you step into the future with The Automaton and those around him. I am Automaton: Kafka Rising by Edward P. Cardillo can be found and Purchased here. The first book in the series, I am Automaton can be found and purchased here. Edward P. Cardillo is an author of horror, science fiction, and dark fantasy. His novel I AM AUTOMATON won a Readers’ Favorite Award and is the beginning of a series being published by Severed Press. By day Cardillo is a clinical psychologist treating anxiety and fear; by night he concocts tales to terrify his readers…He enjoys both jobs immensely. This is probably one of the most interesting takes on the Zombie’s I’ve seen. Unlike 90% of most Zombie novels we are not introduced to the Zombies right off the bat. In fact we don’t even know about the Zombies actually existing outside of the main characters weird semi prophetic dreams. Now I’m not going to give much away here in this review, because I want you guys to go read it for yourself. Peter Birdsall has lost his entire squad while on a mission in Tijuana, the only survivor Peter returns home and begins the process of dealing with his survivors guilt. Meanwhile his superiors have other plans for him. Faced with not only having to deal with his own guilt of surviving while his team mates have not, he is faced with a loss that is much closer to home. And when his younger brother Carl announces his intents to enlist in the army as well, Peter will do anything to keep his younger brother safe. 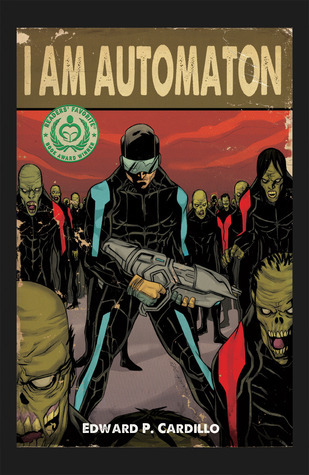 The plot of I Am Automaton is fast paced and driven, Edward Cardillo really did his research when he wrote this book, and made his future of the world a very dirty and terrifying reality. He builds his characters well and easily makes you feel for our two main characters. The Zombies are while sometimes amusing are just as terrifying as any other Zombie of come across in recent years. The story does a wonderful job of building itself up, having you hold your breath and crossing your fingers that everyone will survive. This was a book I could not put down from beginning to end, and when I wasn’t reading it I found myself wondering what would happen next. This is a great read and if your a fan of the Zombie Genre its not a miss at all. If anything this is a hit and I can not wait to start in on the second and third book in the series. He enjoys both jobs immensely.